Even though there is less than a week until Easter, these two crafts are so easy (you may even already have the items required in your home) that you can probably get them done very quickly. 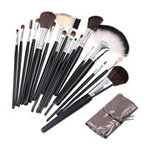 However, even if you don’t, anything you may need can very easily be found in your favorite local stores. First, my daughter and I made these fun little Easter glass decorations. All you need for these are decorative glasses (I used some margarita glasses I had in the kitchen cabinet), a small bowl of water, a small bowl of white sugar, jelly beans and Peeps. To begin, we evenly divided our jelly beans (we used Jelly Belly jelly beans) between four small bowls (to match the number of margarita glasses we had for the project). 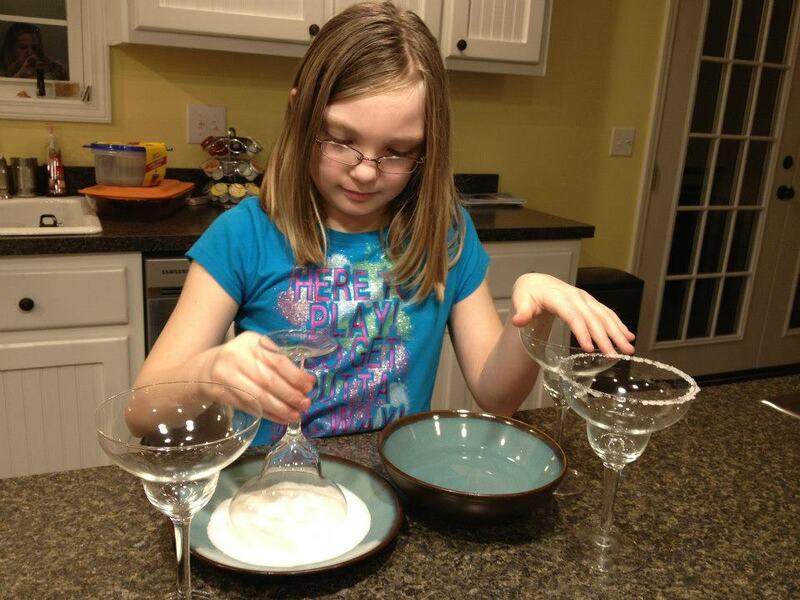 Next, take one of your decorative glasses and turn it upside down, dipping the rim first into a bowl of water and then into the bowl of sugar. You can use a few drops of food coloring to color the sugar, if you wish. I did not think of doing that for our project, but that would have been super cute! 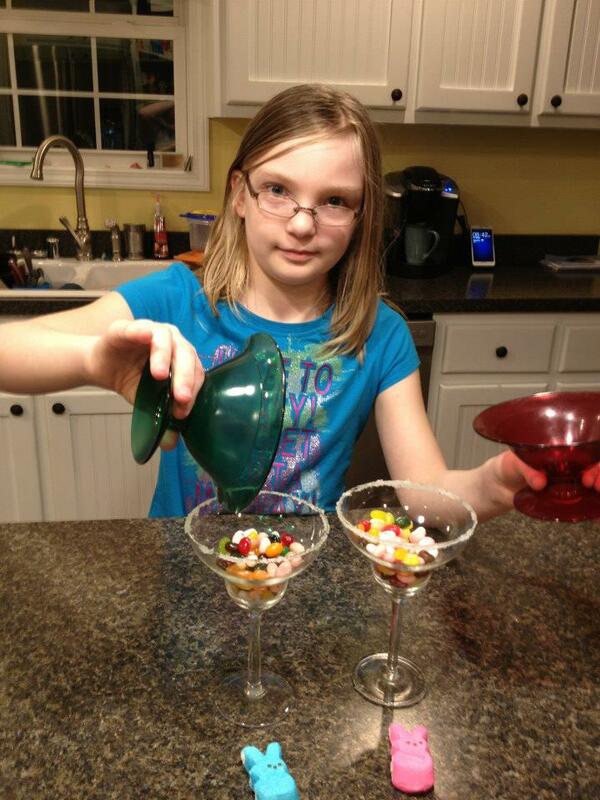 Add the jelly beans to your sugar-rimmed decorative glasses. 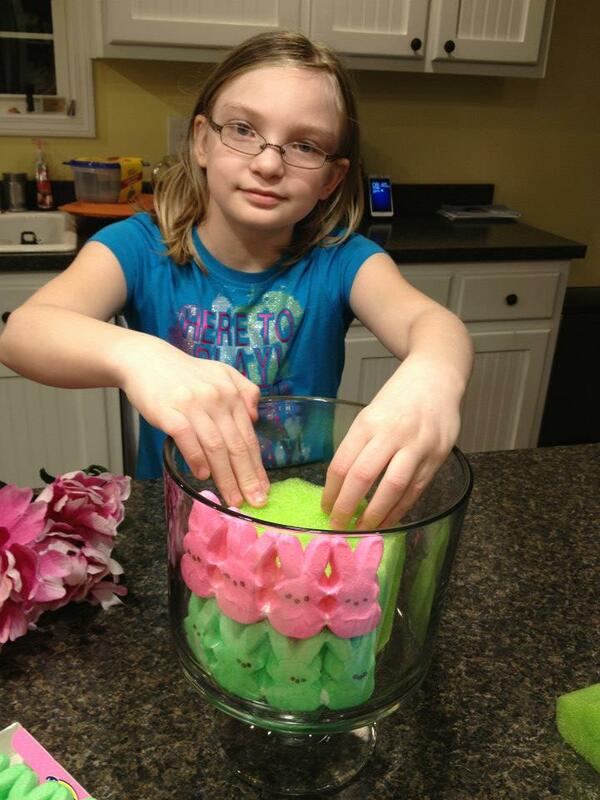 Cut a slit in the bottom of the Peeps and add them to the rim. I cut from front to back on the Peeps, but you could also cut side to side, totally up to you. 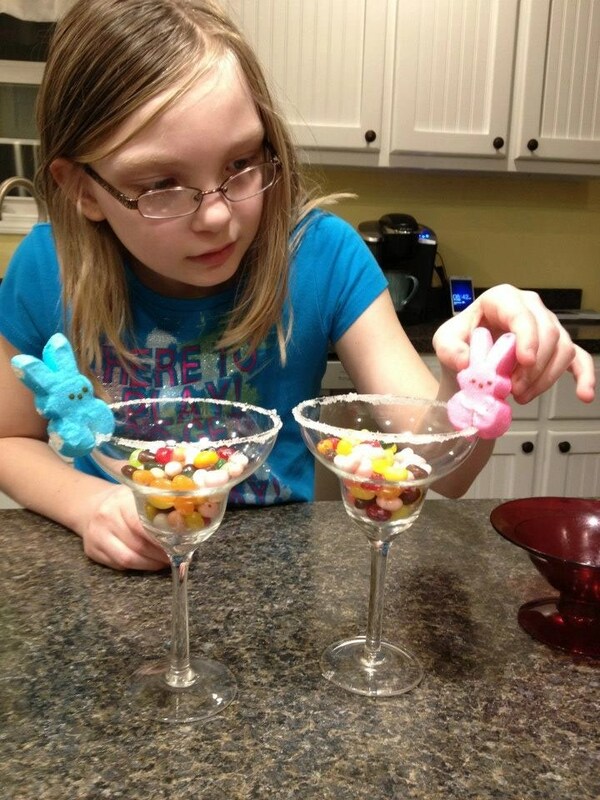 You could stick some Easter grass in the glasses before adding the jelly beans or use the glasses for a festive drink instead. The possibilities are endless! 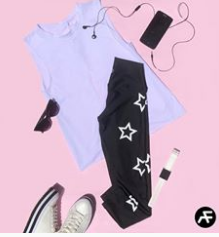 A few simple steps, and done! 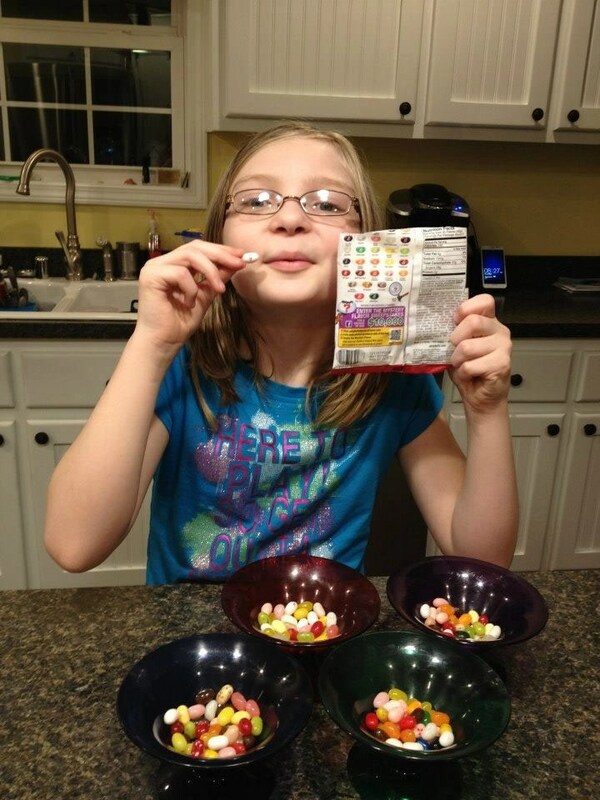 You can use any kids of jelly beans you like. You could even use other kinds of Easter-themed candy to further individualize your project, such as small foil-wrapped chocolate eggs or Cadbury Mini-Eggs chocolate candies. 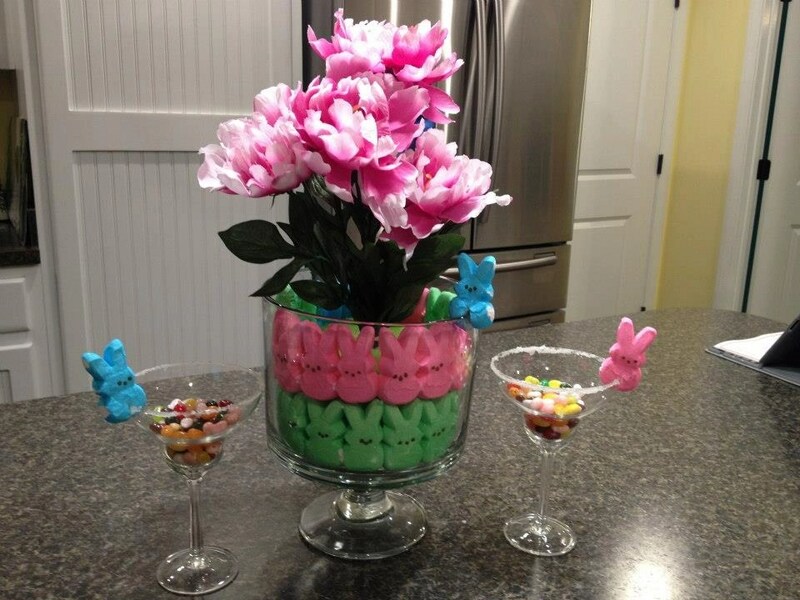 For our second Easter craft, we also used Peeps to create a neat Easter Centerpiece. I used a Trifle Bowl I already had in my home, some florist foam I had from a flower arrangement I had received as a gift, two packages of Peeps ( I think they came about a dozen to a package), some Easter grass, and some fake flowers my daughter had bought at a craft store to decorate her bedroom with. 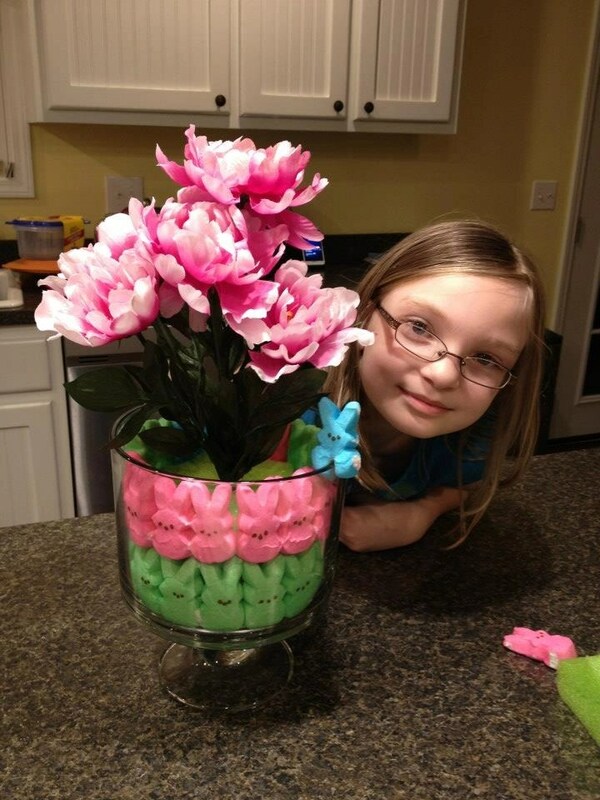 Arrange the floral foam in the center of whatever glass bowl you choose to use for this project and then layer the Peeps between the foam and the bowl, all the way around. If you don’t have floral foam, you could use anything that will fill the center space to keep the Peeps in place, like balled up newspaper or small stones, get creative. You just need anything that you can insert the flowers into that will be sturdy enough to hold them upright. Stick your desired flowers into the foam or other center materials. We stuck a Peep on the side of the bowl rim, the same as we did for the jelly bean project. I also used Easter grass around the base of the flowers to hide the floral foam (though, apparently, I did not take a picture that reflects that step). Voila! We spent about 20 minutes completing these two simple and beautiful Easter crafts for very little out-of-pocket cost. Disclaimer: This post is not sponsored by any company. All items featured are things we had at home or purchased at a retail store for this project.